Yesterday was Andy's birthday. He turned 28, which is scarily close to 30. We've both been pretty apathetic towards birthdays of late. However, I couldn't let the day pass without a well-deserved birthday treat. As a surprise, I ordered cupcakes from Crumb in New York. 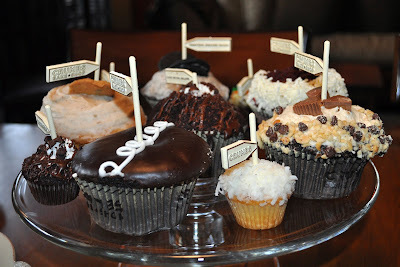 Once, while visiting the Big Apple, we ventured out in search of a crumb cupcake only to find that the shop was closed. I've been left wondering ever since what these highly lauded cupcakes are all about. They arrived packaged in dry ice and were perfectly defrosted by the time 7:30 rolled around. We were hovering, anxious to pig out on fun flavors like caramel apple, oreo, peanut butter cup, s'more, and cookie dough. In truth, they were impressively sized, decadent, fancy, and mildly disappointing. My vote remains with Georgetown Cupcake. The two cupcakeries should have a throw-down. Who knows if cupcakes in-store are better than those specially delivered, but despite their shortcomings, I'll admit that it was exciting to have those giant crumb cupcakes dropped on my doorstep. I'd highly recommend it, if only for delight and pleasure. Anyway, you really can't go wrong with cupcakes, even if they were a little dry. And on another sweet note, a certain special baby will forever share a birthday with the love of my life. Darling Eleanora, welcome to the world! I have a new button! !